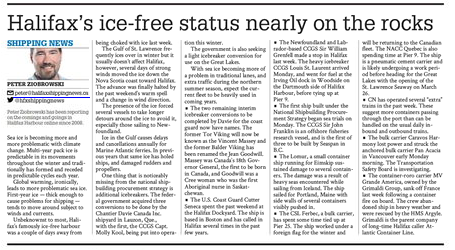 This week in the Herald – Ice. 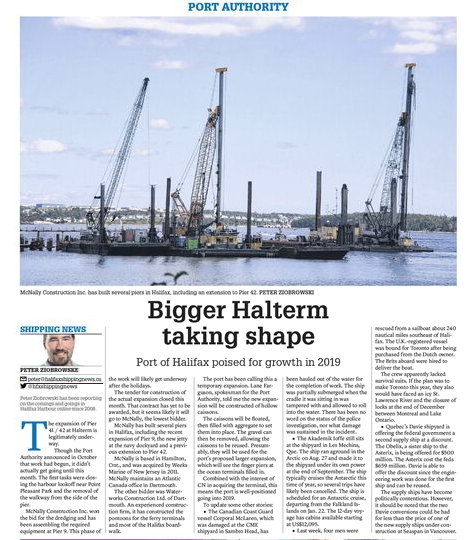 This week in the herald, I talk about how the harbour almost iced over last week. This entry was posted in Herald Column on March 20, 2019 by Peter. This Week i talk about the NEB Trans Mountain Ruling, and what it means on the East coast. The TSB Report on the John 1 grounding can be found here. This entry was posted in Herald Column on February 27, 2019 by Peter. 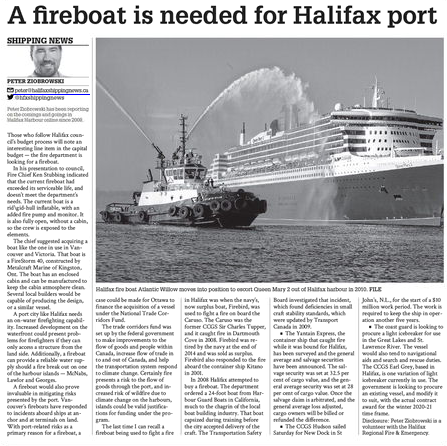 This week I make the case for Halifax Fire to get a new Fireboat, and for the Feds to pay for it. This entry was posted in Herald Column on February 20, 2019 by Peter. 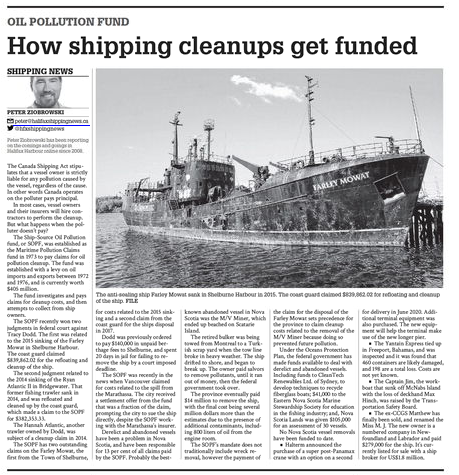 This week i talk about the ship source oil pollution fund, its recent wins in court, and how the province should claim costs for the Miners removal. This entry was posted in Herald Column on February 13, 2019 by Peter. 1. we first heard about it from the Americans. the ETV’s also dont meet the requirements as set out in the RFP the CITT has found, after Hieltsuk Horizon Maritime Services complained. the procurement is currently under review. This entry was posted in Herald Column on February 6, 2019 by Peter. 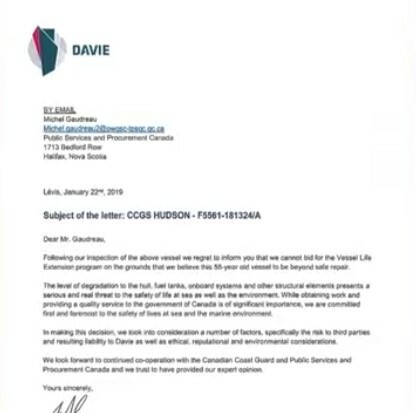 This week I talk about the letter Procurement received from Davie declining to bid on refit work. 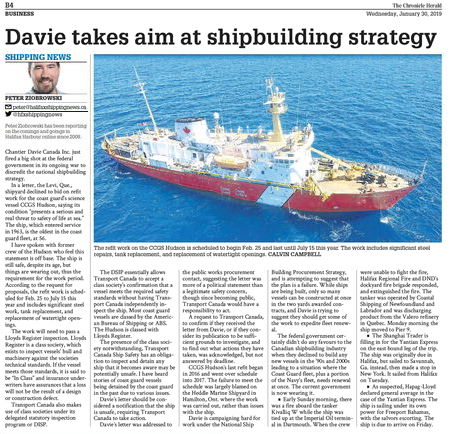 I asked transport Canada’s media contact if they could “tell me if Transport Canada has received a copy of Davie shipbuilding’s letter regarding their safety concerns with the CCGS Hudson, and what actions ship safety will be taking. Transport Canada has not received the letter you are referring to. The department takes its responsibility for marine safety and security very seriously. Large vessels are inspected and certificated annually by a Recognized Organization, which is a classification society that has an authorization agreement with Transport Canada to inspect and certify vessels. 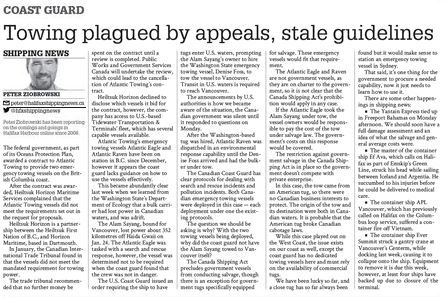 In addition, Transport Canada monitors selected vessels to verify compliance with applicable requirements, such as those set out in the Canada Shipping Act, 2001 and its associated regulations. When concerns are raised, Transport Canada takes appropriate measures if non-compliance or safety risks are identified. Which is really no response – since its a general statement about what the department does, and doesn’t address what they are doing in this situation. 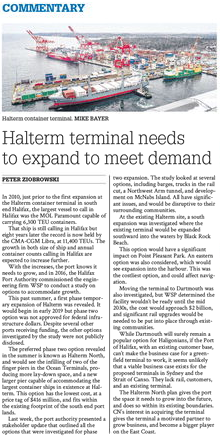 I also have a second piece, where I talk about the Port Expansion, and the details that were released last week. 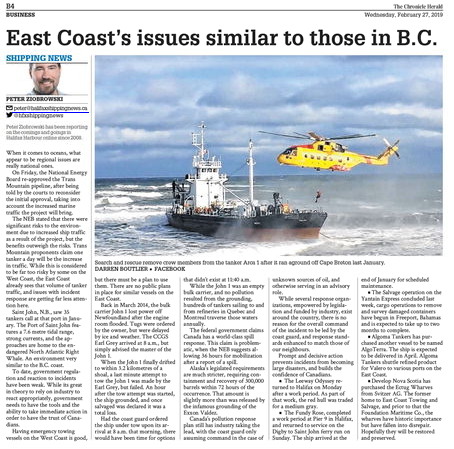 This entry was posted in CCGS, Herald Column on January 30, 2019 by Peter. 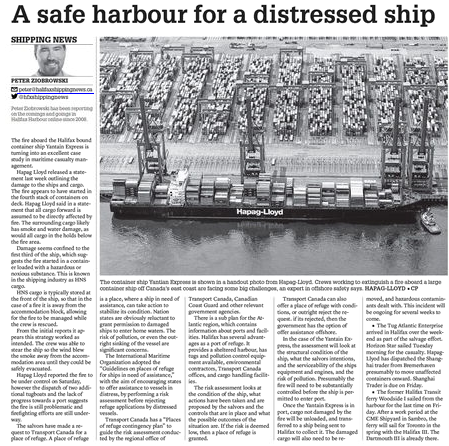 This week I talk about HNS Cargoes, and the response to incidents involving them. Oil Spills are a big concern, but are often simple to deal with – and there are pre-existing plans and resources. 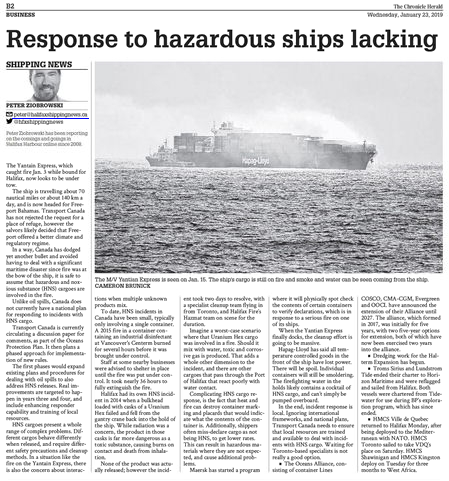 Halifax had its own incident involving HNS Cargo in 2014, when a container loaded with a toxic and radioactive substance fell. you can read the Original post on the Damaged Container as well as a follow up of the container in the Hold, and after removal. This entry was posted in Herald Column on January 23, 2019 by Peter. this week in the Herald, I talk about places of refuge. The Yantain Express has requested a place of refuge (Halifax) from the Government of Canada. You can read the national places of refuge contingency plan here, and the Atlantic region subplan here. This entry was posted in Herald Column on January 16, 2019 by Peter. 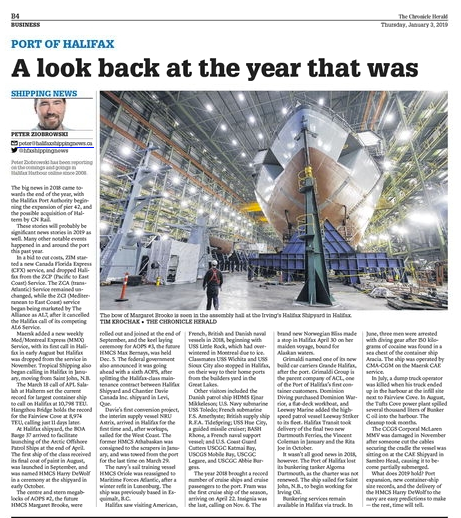 This week in the Herald, I look back at the year 2018. rest assured the usual Year in review post with links to all the stories will be posted next week. This entry was posted in Herald Column on January 3, 2019 by Peter. this week, You can find me on the front page of the Business Section. The Construction of the Halterm Expansion is Finally underway, for real this time. This entry was posted in Herald Column on December 29, 2018 by Peter.